These little Nutter Butter Easter Chicks are just so adorable. I whipped them up in no time this morning. The kiddos have seen all of the Easter Novelties released at the stores this past weekend and I guess I teased them a bit with my Homemade Reese’s Peanut Butter Eggs. They all decided it was time to break out the Easter Decor and their Easter Baskets. I know, a bit early eh? ha ha! 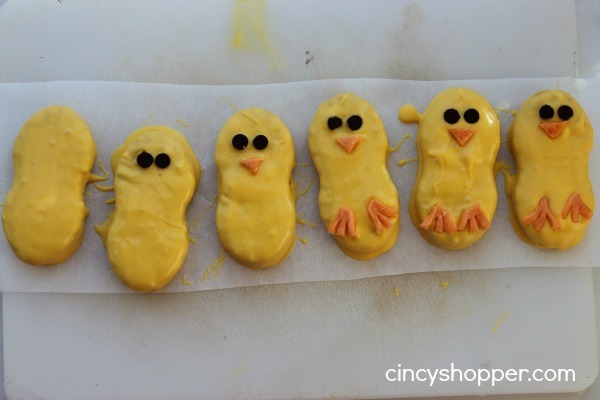 I figured I would surprise them with these cute little Nutter Butter Cookie Easter Chicks for their afternoon snack today. 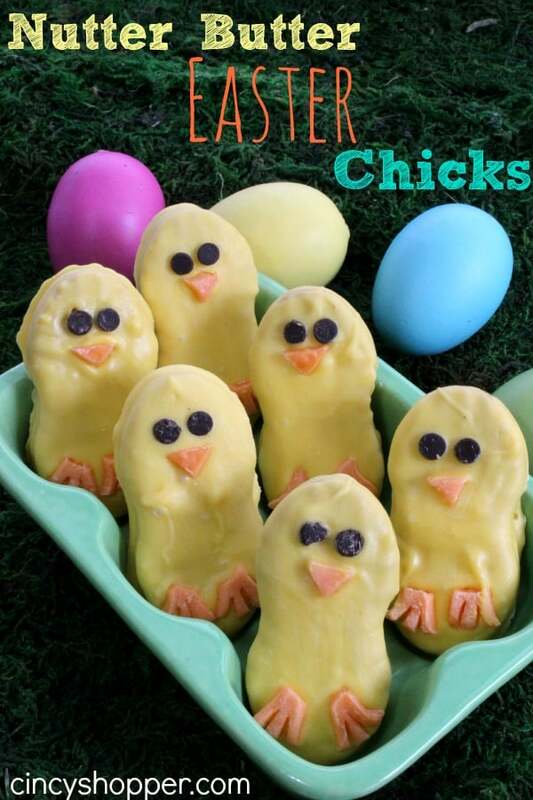 If you are needing a cute, quick and easy treat idea for Easter, these Nutter Butter Easter Chicks would be a great idea. 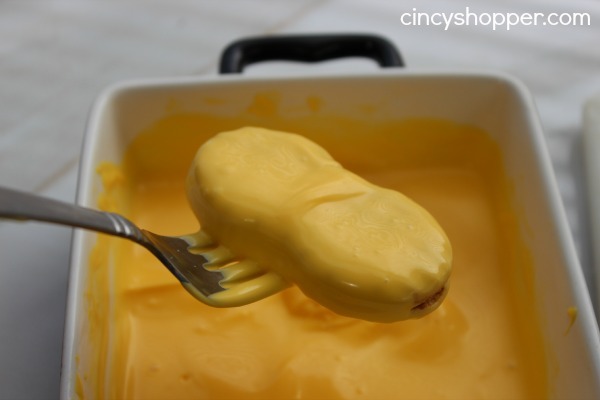 I am thinking they are just too cute and will go well on our Easter Dessert Table too! I had picked up some spring colored chocolate melting chips at Michael’s yesterday with my 50% off Coupon and my additional 25% Off entire purchase coupon. I scored some serious deals. So I had the yellow chocolates on hand. I also had some leftover Starbursts from Halloween (I know, yikes! I checked the date and they were all good) that I figured would work great for the little chicks beaks and feet. Easter and Spring is such a fun time of year. I am so so excited about the possibility of the warm weather, sunshine, flowers and everything Easter. I am sure many of you are ready for this cold weather to be history too! 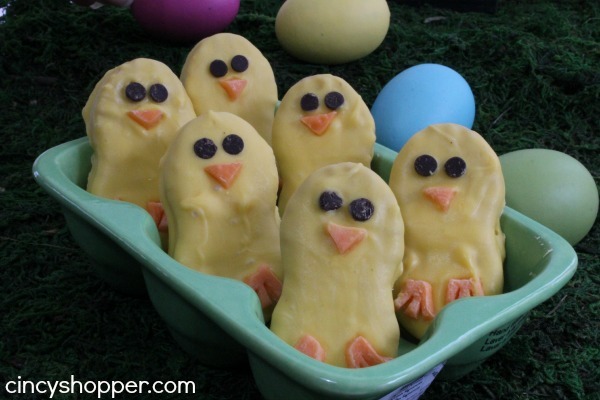 Make these Easter Nutter Butter Chicks and you will be in the springtime mood almost instantly. I promise they just make you giddy, ha ha! 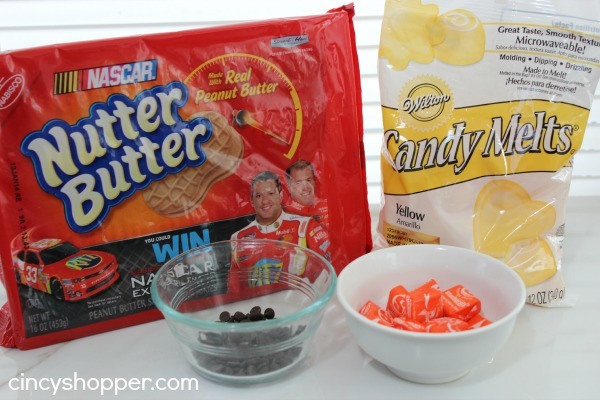 Carefully remove from candy so the cookie doesn't come apart, and let excess candy drip off. Oh, my gosh! Those are stinking adorable! HAHA theses maybe the cutest cookies I have ever seen! I just had to pin them! I cannot even begin to tell you how cute I think these are! Well, I guess everyone else said the same thing. I pinned them and will be making them for the teachers at my son’s school next month! Hi Audrey! I am so happy that you plan to make these cute little chicks. They will be a great gift for the teachers. I should make a batch and do that myself (thanks much for the tip). these are just so sweet!! pinned them! What cute little Easter Chicks, great idea! Thank you so much for coming to the party today and sharing with Full Plate Thursday. Have a great week and come back soon! These are adorable and your website is amazing. I came here from Pinterest. Hi Msjbelle! Thanks Much! I am glad you found my site. I have quite a bit of fun making up cute treats for the kiddos (we have 5 so they are always looking for treats). I am excited as we plan to place these on the kids dessert table for Easter. We will have quite a few kiddos over for the holiday. I am sure they are going to enjoy them as they are SO cute in person.